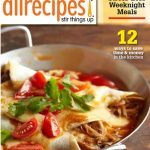 Just when you thought print was dead, along comes a new magazine from the website AllRecipes.com. Instead of going from print to digital, it’s going from digital to print. Of course, the website will still exist, but this November you can get the magazine too. The new “AllRecipes” magazine will cost $12 for a two-year subscription. The initial subscriber base is expected to be 500,000, which is very big. (People are always asking “What’s cooking?”). Print is handy to have in the kitchen. It’s easier to drip tomato sauce on a printed page than on your iPad. Mashable.com reports that print advertising in the food category is up over 10 percent this year. Bon Appetit’s advertising revenue was up 42 percent in the first quarter. Food Network Magazine has 1.55 million subscribers. HGTV Magazine has 800,000. Both have websites. NOTE: Bob has written a lot of stories about food and restaurants and points out that you should be wary of recipes that look normal except for one strange or exotic ingredient. That’s often done simply to avoid copyright problems versus somebody else’s nearly identical recipe and has little or nothing to do with the final taste. Ignore weird ingredients.